With Capoeira I get a surge of childhood wonder, a sense that there is always something waiting around the corner to be discovered. It’s thrilling to be a part of this art form that is living, breathing, evolving and at the same time anciently rooted in a rich soil of tradition, culture and folklore. Capoeira understands that life is paradox; it embraces and translates our living contradictions into a dialogue of movement and form. Sometimes in class when we partner off to work on drills, our teacher will say something like: “Don’t ask your partner how their day is going or what they had for lunch. You’ll know how it’s going by the look in their eye and the way they throw their kicks. Just play.” It is a reminder to us students that Capoeira speaks a language unto itself, similar to how a smile translates internationally. Last week at class we were taught the ceremonial dance called Maculele. Apparently, this dance stems more from a Native American than African tradition. And traditionally, it was done around fires using machetes instead of sticks. We use sticks. Our teacher explained to us that everything plays off of a four beat count and the aim is to hit your sticks, or the stick of another person, on the one beat. He also said that there are only two speeds, slow and fast. Which basically means this dance is hype and expressive with a lot of jumping and flailing of arms. It felt so freeing, like being in the wild, whipping around those sticks because my mind can be nowhere else but completely absorbed in the movement and rhythm. I can feel the energy of Maculele is different than Capoeira but I have only done one class so I can’t speak about this is yet. About midway through class I asked about the story behind Maculele. As our teacher began to talk, I felt his words merge together in my mind like I was at the convergence point of many rivers, the place where the individual becomes the collective. His story was sparking memories and pieces of conversation that I had either heard before or had myself. At the end of his telling I made two cool connections: 1) I had listened to this story in the form of a song before that I found on a fellow Capoeiristas website. You can check out the song– Maculele by Ahd Child –and absorb the story better than I can write it. 2) I remember referring to Capoeira as a unique bridge of connection during my introductions at Wisdom Keepers Council, two months later and I am learning a Native American dance in Capoeira class. 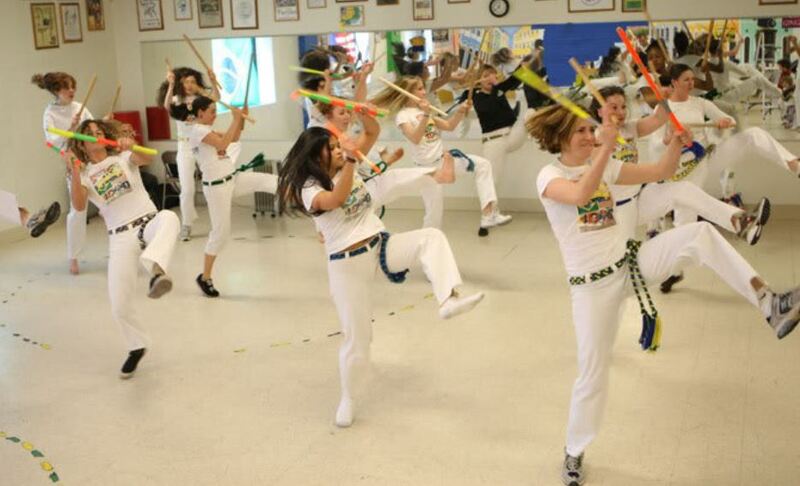 If you’d like to see a live Maculele performance click here: Capoeirando 2013. (The dance doesn’t start til 1:00 min in. Unfortunately, this is not my Capoeira group but it gives you a feel and flavor for the dance.) My other teacher, featured in photograph above, is respected as “the queen of Maculele”. I have not seen her in action yet, she is still recuperating from a knee surgery, but hearing her husband talk about her black light Fringe Festival Show gives me the chills. This entry was posted in Featured Series. Enter email address to receive notifications via email of new posts.